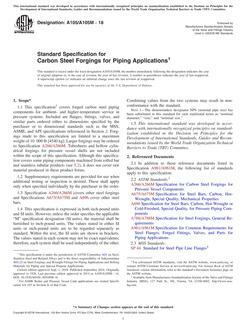 1.1 This specification2 covers alloy and stainless steel bolting materials and bolting components for pressure vessels, valves, flanges, and fittings for high temperature or high pressure service, or other special purpose applications. See Specification A962/A962M for the definition of bolting. Bars and wire shall be hot-wrought and may be further processed by centerless grinding or by cold drawing. Austenitic stainless steel may be carbide solution treated or carbide solution treated and strain-hardened. When strain hardened austenitic stainless steel is ordered, the purchaser should take special care to ensure that Appendix X1 is thoroughly understood. 1.2 Several grades are covered, including ferritic steels and austenitic stainless steels designated B5, B8, and so forth. Selection will depend upon design, service conditions, mechanical properties, and high temperature characteristics. 1.3 The following referenced general requirements are indispensable for application of this specification: Specification A962/A962M. Note 1: The committee formulating this specification has included several steel types that have been rather extensively used for the present purpose. Other compositions will be considered for inclusion by the committee from time to time as the need becomes apparent. 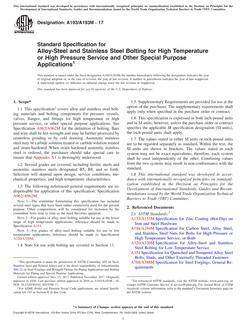 Note 2: For grades of alloy-steel bolting suitable for use at the lower range of high temperature applications, reference should be made to Specification A354. Note 3: For grades of alloy-steel bolting suitable for use in low temperature applications, reference should be made to Specification A320/A320M. 1.4 Nuts for use with bolting are covered in Section 13. 1.5 Supplementary Requirements are provided for use at the option of the purchaser. The supplementary requirements shall apply only when specified in the purchase order or contract. 1.6 This specification is expressed in both inch-pound units and in SI units; however, unless the purchase order or contract specifies the applicable M specification designation (SI units), the inch-pound units shall apply. 1.7 The values stated in either SI units or inch-pound units are to be regarded separately as standard. Within the text, the SI units are shown in brackets. The values stated in each system may not be exact equivalents; therefore, each system shall be used independently of the other. Combining values from the two systems may result in non-conformance with the standard.